an oversize coat is the season's must-have: a camel or mustard color is the current trend but there are a myriad of choices out there. pump up the coolness by adding a pair of cap toe ankle boots. balance the masculine proportions and the carefree attitude by adding a touch of floral and a colorful and classic statement necklace. That's it! A deliciously wearable yet über chic look that will get you through a relaxed weekend. More fall inspiration this way. 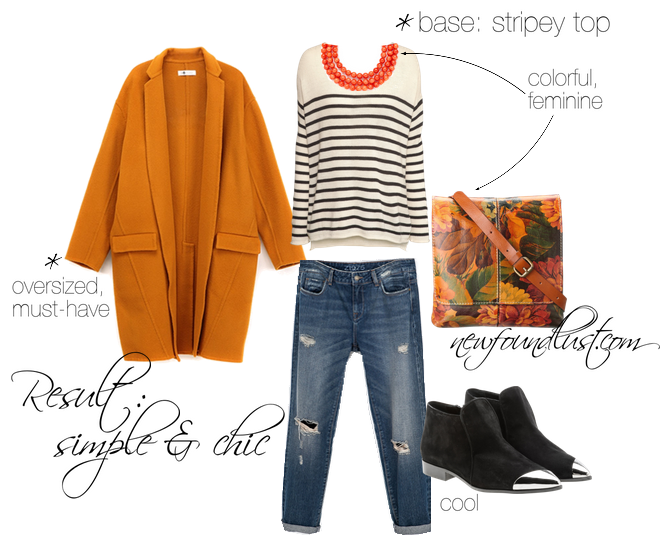 Wool Oversize Coat by W Studio; Stripes Knitted Sweater by H&M; Chunky Orange Jade Statement Necklace by Kluster; Ripped Boyfriend Jeans by Zara; Granada Bag by Patricia Nash; Cap Black Toe Ankle Boots by Miu Miu.